A Pet Nat (short for pétillant naturel) is a sparkling wine from a single vintage that undergoes a single fermentation. The wine ferments with its own yeast in tank or barrel and is transferred to bottle before the process is completed (with latent sugar). The fermentation continues without addition of yeasts, enzymes or sugar until it finishes. The wine is then usually disgorged off its solids and topped up with the same wine. There is no dosage, no other filtration, no sulphur addition. This is the time when the last grams of sugar have been duly converted and the first Pet Nats begin to buzz out of the wineries. This method is also known as the ancestral method. It differs from methode champenoise in that the latter undergoes a secondary fermentation with the addition of a liqueur and normally requires a lengthy period of ageing on the lees. It is a truth universally acknowledged that the moment anyone even mentions the words “summer” and “rosé” in the same sentence then the heavens inevitably open and decant merrily on this hubris. Ne’ertheless. This is the time when the last grams of sugar have been duly converted and the first Pet Nats begin to buzz out of the wineries. Tis the season to be petty. One of the reasons we love to drink these wines is because they are made with good ripe fruit rather than relying on the autolytic converter of time to make them palatable. Almost invariably from organically farmed, hand-harvested fruit the wines are not too fizzy either, being more on the frizzante with little pearls of sparkle. No dosage – so none of that champenois style sweet-sour aftertaste. Often light in alcohol. Low or zero-added sulphur so more portable the next day. Fun – cute labels and crown caps. We love ‘em. 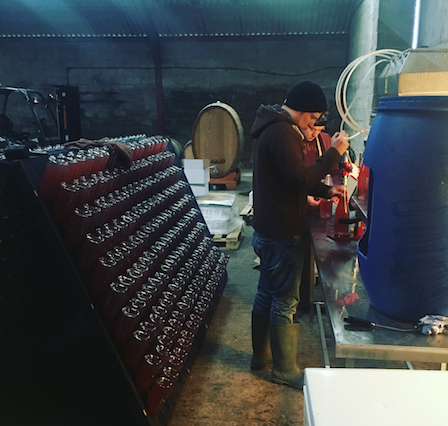 For those seeking the bubble reputation even in the canon’s mouth (the canon being a wine glass in this case we can give you bubbly aspirants a rundown of what’s popping in our fizzical pipeline. This Auvergnat (pun intended) hails from the bullseye of France, where the Loire bubbles up, so to speak. All grapes lead to Gamay here, and this is a pale, pert frothsome pink with nice freshness and a touch of residual sugar. We fondly recall the 09 version of this wine which triple fermented in the winery. It had extreme vulcanicity. On joue with this particular party-popper liquid space-dusty Anjou. Composed of Grolleau Gris, Gamay and Cabernet Franc – really crackling with frivolous freshness, fun from the tips of your toes to the top of your head. Drink with extreme prejudice. Arriving shortly. Another grower who sports a “nat” in his name! It is unusual that a vigneron will only make sparkling wines but Camillo Donati crafts gloriously vinous natural wines (ancestral method) from his steeply sloped biodynamic vineyards in Emilia Romagna. The wines are cloudy and wholesome with plenty of structure. We love the aromatic Malvasia secco and the Malvasia Rosa too, whilst the Lambrusco is a foodie wine as is the Trebbiano, one which elevates that maligned grape to a whole other level. La Garagista is a tiny Alpine farm in Vermont where Deirdre Heekin and Caleb Barber make wines from hybrids – in this case the La Crescent variety. The name Grace & Favour is inspired by Hampton Court. (La Crescent is descendent from Muscat d’Ambourg, also known as Black Hambourg”. Deirdre writes: “The Great Vine at Hampton Court is Black Hambourg. “Caleb and I made a pilgrimage to pay our respects to the Vine and whilst there read some of the history of Hampton Court. After Richelieu took over the palace from Henry the 8th, the apartments in the palace were given to ladies in waiting and chevaliers in “grace and favour”. We thought this was a perfect nod to La Crescent’s parentage”. The wine has a beautiful golden yellow colour and enchanting aromas of pollen, clover, red apples and grapes with naturally mouth-cleansing acidity. “Fox and Hare” is a label devoted exclusively to Pet Nat and is a joint enterprise between young Kamptal growers Martin Arndorfer and Alwin Jurtschitch. The wines are fermented on their skins, invariably unfiltered and thus turbid and quite spicy in the mouth. The Fuchs und Hase pets are labelled Vol 1 to 5 and are blends of Gruner with various local grapes. The greater the volume, the bigger the mouthfeel of the wine -natch! Pet Nat is a Sauvignon/Chenin blend, crackling energetically with apple, pear and ripe citrus. These two grapes complement each other beautifully in this wine. Colombard from granitic soils, hand-harvested then fermented in stainless steel at a temperature of 8 degrees. It was racked 6 times during fermentation to remove the sediment. At a sugar of 52g/l it was bottled under crown cap where it was left to finish fermentation and build up a natural pressure of carbon dioxide. After 10 months the bottles were riddled and disgorged and topped with the same wine (from other decanted bottles) and crown capped again. No SO2 was ever added to the wine and neither was any settling or fining agent. Low abv, low ph, high acid and 26 g/l- perfectly-balanced pet nat. With a maceration of twelve hours on skins Alex Craighead’s natty fizzy Riesling has exotic tropical notes with almond and faint honey scents. Bright and frothy on the palate with zingy acidity and Granny Smith apple juice flavours with a light honey drizzle to round off. Who’s for skin contact, amphora-fermented pet nat? We are! This is a belter, being organically-farmed Xarel.lo. Lemon-yellow, with golden tones and fine and well-integrated bubbles. The nose has aromas of white flowers, almonds and quince skins. After a few minutes, notes of fennel and tangerine skin develop. The palate is silky, broad and harmonious, with a hint of salinity and flavours of white fruits such as pear and green apple. Yum! The blend changes every year. In 2018 the combo is 46% Riesling, 22% Pinot Gris, 15% Chardonnay, 14% Pinot Noir and 3% Pinot Meunier from various vineyards, mostly in Martinborough. Stone-fruit and citrus flavours with a generous mouthfeel and modest fizz which will grow as the wine continues to slowly ferment. A fun summer wine growing a touch more serious with time.